Thanks to our electrophysiologist, Rehan Karim, for his help with this post. A very elderly inpatient suddenly had a rapid pulse by oximetry. The nurse put him on the monitor and noticed a wide complex tachycardia. The patient was alert with a normal blood pressure. He had a history of myocardial infarction, with a known lateral wall motion abnormality and a chronic total occlusion of the circumflex. A 12-lead ECG was recorded. Regular, Monomorphic, Wide complex Tachycardia (WCT) at a rate of 190. Interpretation: This is clearly Sustained Monomorphic Ventricular Tachycardia. You may say that interpretation does not matter because electrical cardioversion works for any regular WCT, but you'll see in this case that electricity did NOT work and that interpretation may indeed matter. How do we know it is VT? (1) In WCT, a QRS duration of greater than 140 ms favors VT with only moderate specificity. Duration of 160-180 ms strongly favors VT.
(2) A monophasic R-wave in V1 heavily favors VT.
(3) In VT, the impulse is initiated in myocardium, not in conducting fibers, and thus travels slowly before it arrives at a conducting fiber. Therefore, the initial part of the QRS is slow (wide). In SVT with aberrancy, the impulse is conducting through Purkinje fibers and thus the initial impulse is relatively narrow. ----For cases in which there is an LBBB-type morphology in lead V1 (small r-wave followed by deep S-wave): if there is any precordial lead which has an onset of R-wave to nadir of S-wave of greater than 100 ms, then VT is very likely. Even though in V2 this interval is 120 ms, the rule does not strictly apply here because there is RBBB (not LBBB) morphology in lead V1 (an upright R-wave). (4) Axis (not as helpful here as one might expect): As a general rule, with exceptions: in VT, the impulse starts in the ventricle (inferior and leftward) and travels up and to the right, resulting in an upright R in aVR. This results in a "Northwest" axis, at between -90 and -180 degrees. ----In this case, although aVR appears all upright, the axis is more complex. Note that leads II, III, and aVF are positive, indicating an inferior axis. Why the discrepancy? If you look very closely, you'll see that the impulse starts toward aVR, turns back toward the inferior leads, and then turns toward aVR again, all in very rapid succession. Such a convoluted pathway is also a good sign of VT. There was a suggestion that retrograde P-waves were present and that this might indicated SVT. 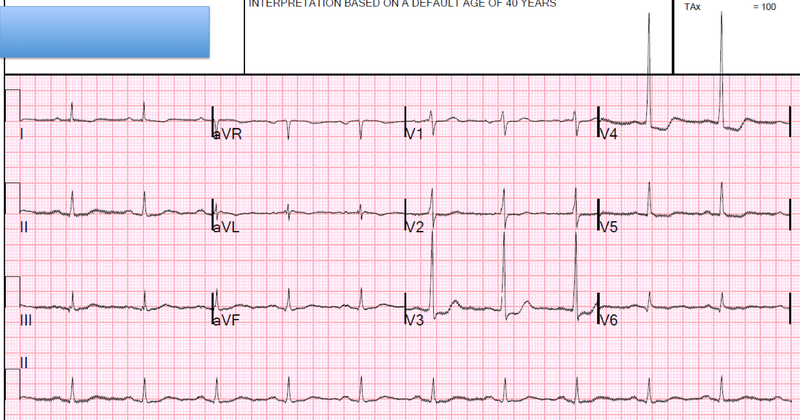 However, I don't see any here, AND the presence of retrograde P-waves does not help to differentiate VT from SVT. 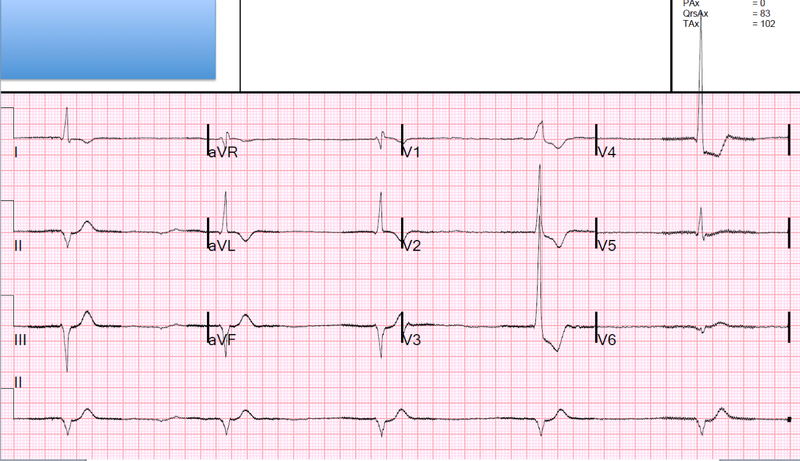 Retrograde P-waves can be seen both in SVT and VT.
--The blood pressure began to drop. --Adenosine 6 mg, then 12 mg was given without any change. --Amiodarone 150 mg was given without change. --A bedside ultrasound showed poor LV function. --The BP dropped to 50-60 systolic after midazolam. --He was shocked multiple times with biphasic synchronized cardioversion at 200 J. The rhythm reportedly converted, then reverted to VT each time. --The patient was greatly distressed by the shocks, in spite of midazolam. --The patient was intubated and given another 12 mg of adenosine without change. --Another 150 mg bolus of amiodarone was given. A previous ECG showed similar R-waves, consistent with the old "lateral" MI and chronic total occlusion of the circumflex. Transcutaneous pacing was successfully initiated. When pacemaker temporarily stopped, patient was in sinus rhythm on the monitor. Decreased left ventricular systolic performance moderate . Regional wall motion abnormality-inferior . Regional wall motion abnormality-inferolateral . Regional wall motion abnormality-anterolateral . The estimated left ventricular ejection fraction is 30-35 %. Later, recurrent VT was terminated again with lidocaine. --Lidocaine is a parenteral type Ib antidysrhythmic. Therefore, the patient was started on started on oral mexiletine, another type Ib antidysrhythmic. --There was discussion of placing an implantable cardioverter-defibrillater. 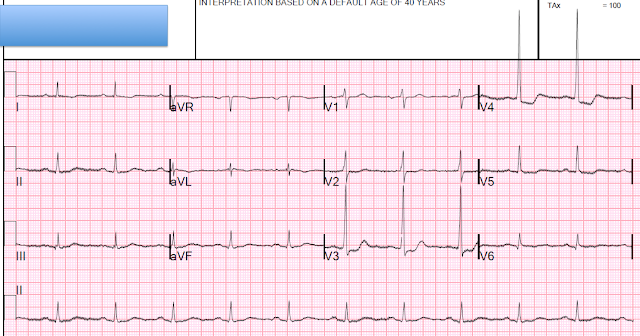 --The VT was thought to be due to scar from old myocardial infarction. --There was a plan to also keep K above 4.0 and Mg above 2.0. While it certainly is incessant (it is not converting with multiple therapies), "incessant VT" is a term usually used for sustained VT that is not causing any hemodynamic compromise. It is defined by at least 2 VT/VF episodes requiring intervention over a 24-hour period. So this is not standard incessant VT, as this patient was not stable. (Adenosine does work for some VT associated with structurally normal hearts, especially right ventricular outflow tract VT -- see this case. These cases generally are in healthy people, are not usually unstable, and are not very wide). ---If you think it is SVT with aberrancy, adenosine is safe in VT and may be worth a try. In this case, the probability of SVT was very low. --Synchronized electrical cardioversion is indicated, using safe and effective sedatives. If the patient is very unstable with altered mental status, cardioversion may be done without sedation. --Occasionally, the machine's algorithm cannot differentiate the QRS from the T-wave, and cannot synchronize, and therefore the shock does not fire at all. In such a case, synchronization must be turned off. This patient received midazolam and the shocks greatly disturbed him and he feared there would be more. Midazolam is also NOT safe. It causes hypotension and respiratory depression. Etomidate (causes annoying myoclonus) or ketamine (may result in emergence dysphoria) are safer. However, any sedative can cause some hemodynamic compromise and respiratory depression, no matter its reputation. --Always replete K to above 4.0 mEq/L and Mg to above 2.0 mEq/L. --Amiodarone bolus and infusion can be very effective and is a good first line agent. 150 mg over 10 minutes followed by infusion of 1 mg/min. The bolus can be repeated to a maximum total dose of 2.2 g over 24 hours. There are potential adverse events, including hypotension. In particular, the diluent can cause hypotension when amio is given too rapidly, and amio has some beta blocking effects. --Lidocaine is less likely to be effective, but also with fewer adverse events. So it is well worth a try. Loading must be given in several boluses, as it is an intracellular drug and takes a few minutes to redistribute from serum. For a standard sized person, give an initial 100 mg over 2 minutes, then 50 mg q 5 minutes x 3 for a total of 4 boluses in 15 minutes. If VT recurs, then an infusion of 1-4 mg/min. "Beta blockers can be used in stable patients if other agents fail, and we don’t want people to take message that they should not use it at all. The key is beta blockade and blocking sympathetic activation is important in these situations of incessant VT where other therapies fail. Actually sometimes we deeply sedate patients to take away sympathetic stimulation and that by itself helps. In fact, some big centers in extreme cases do cervical sympathectomy as last ditch effort." He added that he finds that esmolol often causes more hypotension than metoprolol. After administration of beta blockade, attempt DC Cardioversion again. --Pace termination. If these therapies fail, our electrophysiologist writes: If the VT had not terminated after lidocaine, "I probably would have taken him to cath lab for temporary pacemaker and 'pace-termination' before considering procainamide (of course depending on hemodynamics at the moment)." --Procainamide may work if the above do not, but is especially hazardous with decreased LV function and should be given very slowly, if at all. Give 20 mg/min to a total of 15 mg/kg until the arrhythmia terminates, the BP drops, or the QRS is prolonged by more than 50%. Procainamide slows the VT rate and though it often causes hypotension, it can sometimes be hemodynamically beneficial if the slower rate allows for more ventricular filling time. Maintenance infusion if necessary. --IV sotalol (100 mg IV over 5 minutes) was found to be more effective than lidocaine (100 mg IV over 5 minutes) when administered to patients with spontaneous hemodynamically stable sustained monomorphic VT in a double-blind randomized trial within a hospital setting. However, if the QT is prolonged after you've already given a QT prolonging drug like amiodarone, it is relatively contraindicated. And you can't measure the QT while the patient is still in VT! Ho DS, Zecchin RP, Richards DA, Uther JB, Ross DL. Double-blind trial of lignocaine versus sotalol for acute termination of spontaneous sustained ventricular tachycardia. Lancet. 1994;344:18–23. 2. Adenosine will not work for this VT.
8. Only then consider procainamide, as it is particularly hazardous. Quick summary: For stable VT, Procainamide may be a first choice for those with good LV function, but any of amiodarone, lidocaine, or sotalol may work. Obviously, electricity is likely to work as well, and (just like with unstable VT) this is usually my first choice, saving medications for VT refractory to electricity, or recurrent. In this study of refractory, recurrent hemodynamically destabilizing ventricular tachycardia or ventricular fibrillation, the event rate decreased with increasing doses of amiodarone: median values were 0.07, 0.04, and 0.02 events per hour for the 125-, 500-, and 1000-mg dose groups (mg per hour, with 150 mg boluses for breakthrough VT), respectively, representing a significant decrease from baseline event rates. There was a 26% rate of hypotension as an adverse effect. Resuscitation. 2013 Nov;84(11):1512-8. doi: 10.1016/j.resuscitation.2013.05.022. Epub 2013 Jun 3. Prophylactic lidocaine for post resuscitation care of patients with out-of-hospital ventricular fibrillation cardiac arrest. Kudenchuk PJ1, Newell C, White L, Fahrenbruch C, Rea T, Eisenberg M.
Antiarrhythmic drugs like lidocaine are usually given to promote return of spontaneous circulation (ROSC) during ongoing out-of-hospital cardiac arrest (OHCA) from ventricular fibrillation/tachycardia (VF/VT). Whether administering such drugs prophylactically for post-resuscitation care after ROSC prevents re-arrest and improves outcome is unstudied. We evaluated a cohort of 1721 patients with witnessed VF/VT OHCA who did (1296) or did not receive prophylactic lidocaine (425) at first ROSC. Study endpoints included re-arrest, hospital admission and survival. Administration of prophylactic lidocaine upon ROSC after OHCA was consistently associated with less recurrent VF/VT arrest, and therapeutic equipoise for other measures. The prospect of a promising association between lidocaine prophylaxis and outcome, without evidence of harm, warrants further investigation. Nice case and EXCELLENT points made by Dr. Smith about the etiology of this WCT ( = Wide-Complex Tachycardia) rhythm. That said, I calculate the ventricular rate to be a bit below 190/minute — and when measured beat-to-beat, there actually is some irregularity to the rhythm (more so toward the end of the tracing). These subtle points emphasize Dr. Smith’s 1st sentence under his Interpretation — namely, that interpretation of this wide rhythm DOES matter — because knowing that the rhythm is VT tells you which treatment path to pursue in this patient who did not initially maintain sinus rhythm following initial attempts at cardioversion. Another fine point — namely, that it sounds like this patient wasn’t truly “resistant” to cardioversion — but rather that she converted to sinus rhythm, and then immediately reverted back into sustained VT. Knowing this is also important — because seeing sinus rhythm with the narrow QRS complexes that we see on the 3rd ECG shown in this blog post, even if this sinus rhythm only lasted for a few seconds — confirms beyond doubt that the WCT rhythm is VT. Rarely one may see dramatic baseline QRS morphology alteration in an older patient with a history of extensive coronary disease — such that some irregularity in the WCT rhythm may on rare instances be due to AFib. While all the superb reasons Dr. Smith presents above make likelihood of VT for this initial WCT tracing at ~ 99% — seeing a few seconds of narrow and fairly normal QRS morphology (that then reverts back to VT) increases this likelihood that the initial slightly irregular WCT rhythm seen here is VT up to a full 100%. GREAT case. THANKS to Dr. Smith for presenting! First, it would be almost unheard of for such a patient to not convert, or to continuously revert, with electricity. They all have good LV function, so procainamide is safe. Very different from VT with poor LV function. OK? Are the 21st and 23rd complexes fusion beats? Great case, worth reading every lines. Thank you! Good observation. They might be, but probably not. I say that because the first one is delayed. A fusion beat should start early, right? @ Mario — I meant to make note of the beats you mention in my original comment (but forgot to ….). These beats puzzled me. Although the initial part of this WCT tracing is regular, there is slight irregularity in the latter part of the tracing — and I initially wondered if the beats you mentioned might reflect rate-related BBB (bundle-branch block). VT may of course be slightly irregular (it often is) — though usually not to the degree suggested by the relatively longer R-R interval between beats #20-21 — which is why (despite all morphologic and clinical clues to the contrary) — I initially wondered if we might be seeing AFib in a patient with a grossly abnormal baseline tracing. That said, the fact that repeated cardioversion reportedly resulted in sinus rhythm with a normal QRS (that then quickly reverted back to this wide tachycardia) established beyond doubt that VT was the diagnosis. The beats you mention do not appear to be “fusion” or "capture" because we don’t see preceding atrial activity. It’s an interesting phenomenon, but I can’t explain it further. Yes, a fusion beat should start early in comparison to the VT cycle. Thanks! Any thoughts on the PROCAMIO trial? My limited use of procainamide mirrors the trial. this trial was only for patients with hemodynamically well tolerated VT.
so it does not apply here.